Thousands of travelers fly out of the country everyday. Make sure that you know the prohibited items that you must not carry along to save you from hassle and stress. 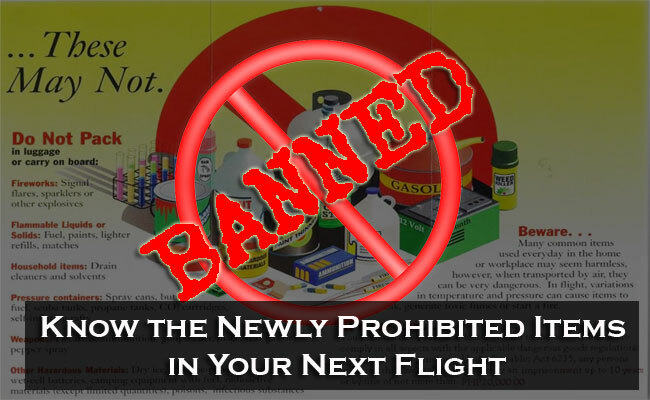 We all know that lighters, tear gas and even gun replicas are not allowed to be taken in the flight, however, there are some things that passengers might overlook in their baggage and might cause them some hassle. Here are some items that you must not bring in your checked-in and carry on bags as advised by Department of Transportation and Communications-Office of Transportation Security in its latest memorandum, the memorandum circular MC2015-02. Office for Transportation Security, states seven categories of lists of items airplane passengers are not allowed to bring along in flights. In the list of Guns, Firearms and Other Devices That Discharge Projectiles items such as air guns; gun and firearm components; bolt guns; flare guns; nail guns; pistols; pellet guns; revolvers; rifles; spear guns; shot guns; and, any sport-related firearms are prohibited by the law. According to the revised circular, all forms of guns and firearms that must be brought on board with legal reasons must be checked in and appropriately endorsed to Law Enforcement Officer. The items such as sling crossbows, shots; and bow and arrows; may be checked in , but could not be carried in carry on baggage. Under the category of Stunning Devices, the tear gas is banned in both checked in and carry on luggage, however, stun guns, acid spray, pepper spray,and insect/animal repellent spray, can be checked in. Of course explosives are banned such as dynamites, grenades, pyrotechnics, ammunition, and fireworks. Devices that could be deemed to start a fire like the lighterfluids, matches, disguised lighters, and fuels are not allowed in either checked in and carry on. Sharp devices such as letter openers, knives,nail cutters, razor blades, scissors, nail files, and disguised objects which could contain sharp objects and blunt objects like large tripods and umbrellas are prohibited in the plain but can be checked in. Under Liquid, aerosols and gels (LAG), you can bring them in flight provided that they are in individual containers and each does not exceed 100 ml. These small bottles must also be in a transparent resealable plastic bag. The total volume must not exceed 1 liter. Passengers are only allowed with a 20cm x 20cm resealable transparent plastic each. However, the medication, baby milk or food and things that require special handling might be carried but those deemed flammable are strictly not allowed.